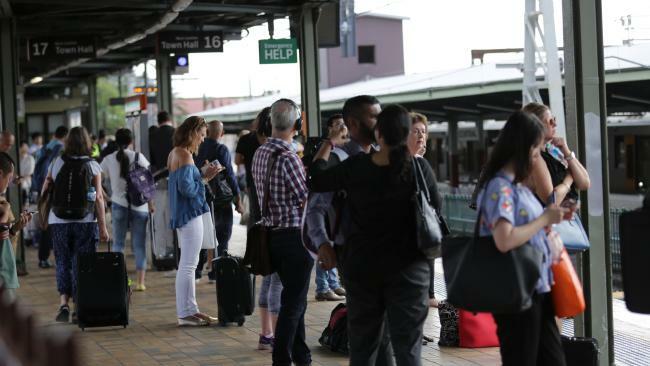 PASSENGERS have expressed their frustration at Sydney Trains after delays caused customers to be stuck for hours, sparking huge delays for the already troubled network. Even one train driver appeared deeply frustrated by the chaos and lack of information, announcing to passengers that "management" had ordered him to make repeated announcements despite having no new information. Some services have been delayed by up to an hour because of urgent overhead wiring repairs at Wynyard in the city's CBD last night. Though the situation was so confusing for some commuters, passengers at Lidcombe station reported the driver simply "didn't arrive". Please delay non-essential travel, utilise local buses or make alternative travel arrangements if possible. Sydney Trains tweeted that services between Wynyard and Central have been suspended in both directions because of the work, and its website says several services have been affected. It also warned that indicator boards, real time apps and train running information may be unavailable or incorrect. Commuters have been told to "delay non-essential travel or utilise local buses where possible". On Twitter, Trans Info had posted several tweets to warn commuters of the significant that they may experience if they were planning on using the train service. Several commuters have also expressed their disappointed on Twitter on the lack of announcement communicating the delays to its customers. Channel 7 also posted images of passengers evacuating from trains at Wynyard last night. The interuptions are likely to cause inconvience to hundreds of Sydney sport spectators who are preparing to make their way to Olympic Park, Randwick and the Spotless Stadium to watch a myriad of sporting events. Those events include the highly anticipated race with champion mare Winx at Royal Randwick and Sydney Swans taking on the Greater Western Sydney Giants at Olympic Park as well as the Bledisloe Cup at ANZ Stadium on Saturday night. Meanwhile, Shadow Transport Minister Jodi McKay told the Daily Telegraph the onus was on Transport Minister Andrew Constance to "assure commuters that trains will be running to normal timetable by this afternoon with major sporting events taking place." "Train commuters have reported today not only that trains aren't running to time but there is a serious lack of information about the cause of delays," Ms McKay said in a statement to the publication. "Thousands of spectators are expected to want to use public transport this afternoon and evening to attend the Bledisloe Cup as well as AFL and NRL games around the city." A Sydney train spokesperson told news.com.au: "Trains services across the Sydney Trains network are being impacted as a result of an IT issue across all transport agencies. "This has affected key operating systems that provide visibility of trains and their locations. Technicians are working to resolve the IT issue with systems starting to return to operation across the transport network. "The safety of our customers and staff remains our highest priority. Our staff are out on the network to ensure services continue to operate safely. However, there are some delays across the network. "We apologise to customers caught up by this issue and would like to assure them that we are working hard to maintain services. "Buses are supplementing services at some stations including Campbelltown, Glenfield, Penrith, Olympic Park and Richmond. "Sydney Trains is operating special services to Olympic Park from 2pm for customers attending the Bledisloe Cup and AFL this evening. Direct services will operate from Central to Olympic Park, in addition to the T7 Olympic Park Line. "Due to trackwork bus services will also be provided to Central Coast & Newcastle Line customers. "Sydney Olympic Park Major Event Buses will start running between 3:05pm and 3:45pm, depending on the route. "We encourage all customers to leave early if attending events and allow extra time when travelling today."